On February 24, 1997 the Atlanta Falcons took a step toward resolving their need for a new starting quarterback. QB Chris Chandler was obtained from the Houston (soon to be Tennessee) Oilers for fourth- and sixth-round draft picks in the upcoming 1997 draft. Chandler had originally entered the NFL as a third round draft choice of the Indianapolis Colts out of Washington in 1988. Mobile and with a strong arm, as well as highly intelligent with a cocky self-confidence, he took over as starting quarterback when Jack Trudeau suffered a season-ending knee injury. Helped by the presence of RB Eric Dickerson in the backfield to attract the attention of opposing defenses, Chandler showed promise and the previously-winless club was 9-4 with him behind center. However, in what would become a recurring theme throughout his career, a knee injury limited him to three games in 1989 and the club traded up to get Illinois QB Jeff George in the first round of the 1990 draft. Traded to Tampa Bay for a first draft pick, Chandler backed up QB Vinny Testaverde for a year and was waived during the ’91 season, at which point he was picked up by the Cardinals. He had a good year with a mediocre team in 1992, taking over for the injured Timm Rosenbach, but played in only four games in ’93 and moved on to the Rams and, after one season, to the Oilers for 1995, where he was reunited with offensive coordinator Jerry Rhome, who had held the same role with Phoenix. Installed as the starting quarterback while rookie Steve McNair was kept on the bench to learn, Chandler put together two good years but, with McNair judged ready to take over the starting job, the rebuilding Oilers chose to deal him away. Intelligent and capable, Chandler had also gained a reputation for being fragile (thus earning the unfortunate nickname “Crystal Chandelier”) and quick to complain when not starting. The Falcons were coming off of a dreadful 3-13 record in 1996 under June Jones, which was a hugely disappointing following a 9-7 record that resulted in a playoff spot in ’95. Jones had installed a version of the run-and-shoot offense that QB Jeff George, obtained from the Colts in 1994, was highly productive in operating. However, George had been suspended and later released by the Falcons following a shouting match with Jones on the sideline during a nationally televised game in September. He moved on to the Oakland Raiders and Bobby Hebert, who took over for George, chose to retire (which was expected but not yet confirmed at the time of the trade for Chandler). The Falcons had also talked to San Francisco’s backup QB Elvis Grbac, who went on to sign with the Chiefs. Those words seemed overly optimistic when the Falcons got off to a 1-7 start, including losses in the first five games, and Chandler missed two starts and was knocked out of four other games with assorted injuries. However, both he and the team rebounded to go 6-2 the rest of the way for a 7-9 overall record. Chandler ranked second in NFL passing with a 95.1 rating as he threw for 2692 yards and 20 touchdowns while giving up just seven interceptions. He was named to the Pro Bowl. The stage was set for a bigger year in 1998. This time the Falcons started strong (5-2) and finished even stronger (nine straight wins to close out the regular season) on the way to a 14-2 record and the Western Division title. Chandler again missed two games due to injury but had another Pro Bowl year as he threw for 3154 yards and 25 TDs, compiling a 100.9 rating. To be sure, the running game, led by All-Pro RB Jamal Anderson (1846 yards to lead the NFC) was a key component of the offense’s success, but Chandler showed improvement as a team leader and, surrounded by capable performers, he excelled. Atlanta edged the 49ers in the Divisional playoff round and then upset the Minnesota Vikings in overtime to win the NFC Championship before being soundly beaten by Denver in the Super Bowl. 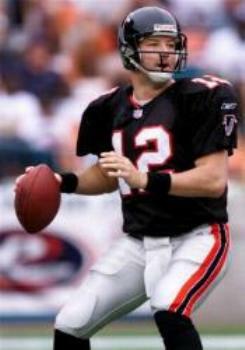 The ’98 season proved to be the pinnacle of Chandler’s career and the Falcons failed to post a winning record during the remaining three years that he was with them. The loss of Jamal Anderson early in the 1999 season severely hindered the offense and Chandler again had trouble with injuries, missing four full games. He also clashed with Coach Reeves as the team sputtered to a 5-11 record and the complaints resurfaced about the quarterback’s fragility and poor attitude when facing adversity. The record fell to 4-12 in 2000 and Chandler threw more interceptions (12) than TD passes (10) for the first time in nine years. He was benched in favor of backup QB Doug Johnson at one point late in the season and after taking a significant battering due to offensive line deficiencies, but showed maturity in accepting the demotion. The Falcons traded up in the 2001 NFL draft to select Virginia Tech QB Michael Vick and Chandler, at age 36, was placed in the role of mentor to the young quarterback – much as he had done in Houston previously. He finished out his Atlanta stint by starting 14 games and completing 61.1 percent of his passes for 2847 yards and 16 touchdowns, against 14 interceptions, for a 7-9 club. Following his release by the Falcons after the season, Chandler moved on to the Bears for two years, where he started occasionally, and finished his career as a backup with the St. Louis Rams in 2004. He had his most productive seasons in Atlanta, where he completed 981 of 1672 passes (58.7) for 13,268 yards and 87 touchdowns while giving up 56 interceptions and being sacked 197 times. His overall career completion percentage was 58.1 as he totaled 28,484 passing yards and 170 TDs against 146 interceptions. But he never appeared in all 16 games in any season, a product of his chronic injury problems. As for the draft choices that the Oilers received in exchange for Chandler in 1997, the fourth round pick was used to take WR Derrick Mason from Michigan State and the choice in the sixth round was in turn traded to New Orleans, where it went for TE Nicky Savoie out of LSU. Mason had a productive career over the course of eight seasons with the relocated Oilers (they moved to Tennessee in ’97 and were renamed the Titans in 1999), catching 453 passes for 6114 yards and 37 touchdowns. He garnered consensus first-team All-NFL honors in 2000 and was twice selected to the Pro Bowl.